JBL speakers are known for amazing sound performance and JBL Flip 4 speaker will not really disappoint you in sound quality. It’s a great sounding speaker with the high-quality bass base. This speaker is for the young millennials who enjoy music on the go. It’s not only portable but it delivers powerful stereo sound. Yes, the speaker is that it is waterproof but doesn’t float like the UE Wonderboom. You can play it at your pool party or house party. It also features built-in echo-canceling speakerphone. So, you can receive your calls with crystal clear quality. It integrates with voice assistant to give you a great music experience. If you compare JBL Flip 4 with JBL flip 3, then this version is much better. The features are updated and there has been a significant improvement in the sound performance of the speaker too. The battery life of this speaker is also better as compared to the previous one. It’s durable so you can easily travel with the speaker. The only issue with the speaker is it suffers in the high range. The design is great and wireless Bluetooth streaming is amazing. For the price, this one is indeed a good option. It’s a worthy upgrade to the previous series of JBL. It can be your multifunction and multi-weather music companion for sure. It’s for pure music listening experience. JBL Flip 4 speaker has an impressive sound quality that delivers amazing performance. JBL does best because it does have neck-to-neck competition with brands like Sony, Ultimate Ears, BOSE etc. The audio is sweet and warm and it maintains the balance in every genre. It will surely entice the music lover in you. JBL Flip 4 speaker is durable so you can carry it anywhere you go. In fact, it is Ipx7 waterproof resistant. It’s ideal for playing it along on a beach or your pool party. The range of the speaker is quite good and this sets it apart from other speakers that are available in this price range. If you love to stream your music loud and clear, then this is an apt choice for you. The wireless streaming of the speaker is simply amazing. It connects to every Smartphone and tablet without any issue. It gives you an impressive stereo sound with wireless connectivity. It also lets you connect to 100 JBL connect + enabled speakers for loud music experience. JBL Flip 4 speaker has a unique voice assistant integration that lets you integrate with voice prompts of your phone. It can integrate with Google Now and Siri. You can simply control your music settings with this feature. It also lets you connect through apps so you can play your music loud. There are many great features of the JBL Flip 4 speaker, let us look at some of them. JBL 4 speaker is the next-gen flip series with powerful sound performance. A true portable Bluetooth speaker delivers powerful stereo sound in any setup. The bass is good and the audio quality is immersive. The speaker has wireless Bluetooth streaming. It connects to two tablets or smartphones at a time giving you amazing sound performance. JBL 4 speaker has Built-in 3000mAh rechargeable Li-ion battery that supports up to 12 hours of playtime. You can play nonstop music with a single recharge. It supports IPX7 waterproof, which means it,’s completely waterproof and dust proof. Now, you do not have to worry about the rains or dust. You can enjoy your music on the go or even while you travel. The speaker features JBL connect +. The speaker can link more 100 connect devices at a single time. This not only amplifies your music but also gives you stereo sound performance. You can connect to many devices to enhance your music experience. JBL 4 speaker has a built-in speakerphone that lets you take calls with a clear sound. It also features echo-canceling feature and you can switch this with a touch of a button for voice clarity. The speaker features voice integration. It lets you integrate with your phone through Siri and Google now. You can access your music with this integration feature. The speaker is made from superior durable fabric so it’s also sturdy. The rugged rubber lasting is great for outdoor adventures and trips. JBL 4 speaker has super JBL bass radiator. You can feel the bass base with dual passive bass radiators. This helps to deliver a powerful sound every time you play your music loud. The speaker features Bluetooth version 4.2. JBL 4 speaker is available in six different colors so you can take your pick from the color you love the most. The wireless and Bluetooth connectivity of the speaker is good and there are no hiccups. The speaker looks heavy but its light in weight as it weighs around 515 grams. The design of the JBL 4 speaker is similar to the previous versions by JBL. There is no major change in the design as it cylindrical in shape with exposed passive radiators. But, if you compare it with the other models, then this one features water-resistant IPX7 and that makes the speaker durable. In fact, you can completely immerse the speaker in water and see the result. The fabric is rugged and that seals the dust and stain. The build quality is awesome and sturdy even if you drop the speaker there won’t be an issue with sound quality. The JBL Flip and JBL Charge series of portable Bluetooth speakers have been very popular. This is why the company keeps adding more improvised versions each time. The sound quality of the JBL 4 speaker is similar to the previous version and not much has changed here. But, the sound performance is amazing with its amazing bass effect. The low range and midrange are good and there is no distortion. In the higher range, there can be a slight distortion. If you play on full volume, it can cause a slight break. It’s clear and crisp in any genre. The background instrument can also sound different at times. But, the sound quality is indeed good for the price. The 360-degree sound performance is missing and that can be a major disappointment. Nothing much has changed in the setup of the speaker as well. The control options are similar and the volume buttons are the same. The output power and frequency response are also similar to other JBL speakers. The best part about the speaker is that it features a JBL bass radiator. The dual external radiators give you immersive sound clarity so that you can enjoy your music loud and clear in any setup. You can actually feel the bass with this powerful feature. The software is updated according to the connections you make. Once you integrate the speaker with devices, the settings can be changed. 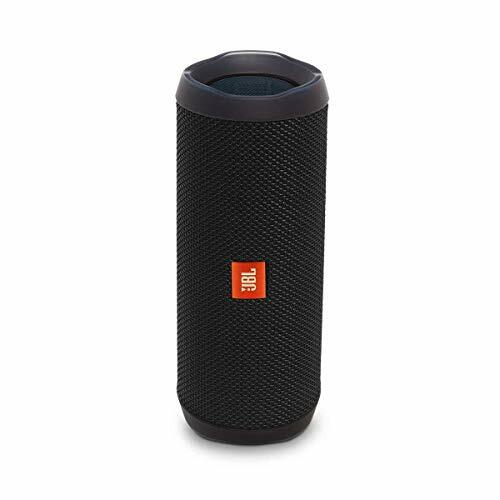 JBL 4 speaker is a powerful and good sounding speaker. It delivers powerful stereo sound performance that can enhance your music experience. The performance of the speaker is so good that you can play it loud at any party or while you hang out with your friends. There are no issues in the mid-range of the speaker, which is great. The speaker is compatible with almost all the devices including tablets and Smartphone. It lets you play through your wireless and Bluetooth integration and helps to deliver a great sound. The overall performance of this speaker is simply amazing. The speaker is great on connectivity and there are no hiccups. It connects to two wireless smartphones or devices at a single time. The speaker also features JBL connect + that lets you connect up to 100 JBL speakers together. This will surely amplify your sound to a good extent. The battery performance of the speaker is good and that is amazing. It gives you 12 hours of battery backup with a complete charge. There are wireless speakers that offer up to 16 hours of battery life, so this could have been better. Still, you can enjoy your music on the go with 12 hours of playback. The charge is also quick. The sound clarity is good. The audio is warm and balanced. It has a multi-speaker setup. Can distort in the higher range. JBL 4 speaker is versatile with amazing sound performance and great features. The audio is truly improved in mid range and low range. It has a balanced and warm tone in music. The build of the speaker is sturdy and it’s durable. Being waterproof, you can carry it along with you to all your outdoor trips or beach trips. The price of Flip 4 seriously competes with that of Ultimate Ears Boom 2. It has a multi-speaker setup that helps to amplify the sound to maximum level so that you can play your music loudly. The only issue with this speaker is its battery performance. It gives you up to 12 hours of battery playback time and that is still average. JBL 4 speaker is a great sounding speaker with outstanding audio clarity, this should be a must buy on your list.